It was a warm fall morning on October 9, 2017, and harvest was underway on the Sass’ farming operation in rural Streator, Illinois. Darla Sass was doing dishes in the kitchen when she heard ambulance sirens and the sound of an OSF Life Flight helicopter, which is based full-time at the Illinois Valley Regional Airport – Walter A. Duncan Field in nearby Peru. “I said, ‘that sounds close.’ But I didn’t go look outside. I figured God had it in his hands,” Darla said. On the ride to OSF HealthCare Saint Francis Medical Center in Peoria, Darrin told his mother what had happened. The Sass family runs a 2,500-acre farm operation that’s been in the family since 1864. Dale Sass, 66, is the fifth generation. His son and nephew are sixth generation. That morning, Dale was greasing the gear boxes of the sweep augers in the empty grain bins. The sweep auger rotates along the floor inside the grain bin to move the grain. They travel at a faster rate when there is no grain present, as was the case that morning. The auger motor came on unexpectedly. Dale was in front of the auger and it immediately pulled in his left leg. “As soon as it grabbed my left leg, I couldn’t get out of it. I was laying down and was holding the auger to stop it from going over the top of me,” he said. The auger worked its way up Dale’s left leg and then it grabbed the right leg and pulled it in, snapping his femur above the knee. Daniel Beutke, a Sass employee and chief of the Long Point Volunteer Fire Department, was nearby when his fire department pager went off. “I ran into the bin to assess things and Dale said, ‘Get me a helicopter,’” Daniel said. Dale saw the damage the auger had done and knew he needed OSF Life Flight. The helicopter landed in a tight grassy patch right behind the grain bin. The auger broke bones in both of Dale’s legs and his left ankle, shredded skin, tendons and cartilage and completely destroyed his left knee and most of his right. Orthopedic surgeon Dr. Rob Kinzinger handled Dale’s case. During Dale’s 21 days at OSF Saint Francis, Dr. Kinzinger put rods in to repair the right femur and left tibia. He fixed the left ankle and repaired both of Dale’s patellar tendons – the tendon that goes from the knee cap to the shin bone – as both of those were cut. Dale went through extensive rehabilitation after coming home. 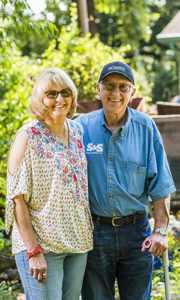 He received care through OSF Home Care Services, and continues weekly therapy and home exercises. He uses a cane to get around and still has weakness in his legs. His right femur hasn’t healed completely and Dr. Kinzinger said Dale likely will need a knee replacement due to the damage.